The Sanlorenzo SL106 motor yacht was asking €9,600,000. 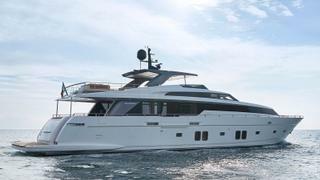 A new-build 32.2 metre Sanlorenzo SL106 motor yacht has been sold by Bertrand Vogele at Seaminds. To be built in GRP by Italian yard Sanlorenzo with an exterior and interior by Francesco Paszkowski, she is due to be delivered in May 2018 as one of the yard’s ever popular SL106 models. Accommodation in a neutral coloured but bright and airy interior is for eight guests in four cabins consisting of a master suite, VIP suite and two doubles, all with entertainment centres, television screens and en suite bathroom facilities. In addition, there are quarters for up to four crew. A large saloon with panoramic windows allows guests to bask in the natural daylight on comfortable seating including an L-shaped settee and armchairs, while a full wet bar and an entertainment centre including a large screen television are also on offer. Forward is a dining area with seating for eight guests. The aft deck has al fresco dining facilities at a large table and chairs seating eight guests and leads down to a generous swim platform. Up on the flybridge the easy pace of outdoor relaxation continues, offering sun pads, loungers, a spa pool and a wet bar, all sheltered by a hard top. Twin 2,434hp MTU diesel engines will give her a cruising speed of 24 knots and a maximum speed of 28 knots. The Sanlorenzo SL106 was asking €9,600,000.